LinkyCat.com collects your information from different part of our web site. To use our services, you are required to provide us your personal information and contact information, such as e-mail address. At the time you use our services, we will automatically track certain information about you, which includes your IP address, what browser you are using, the URL that you just came from, and which URL you go to next. This information is collected for administrative use only. LinkyCat.com is not responsible for the information you volunteer about yourself in the course of discussions in our forums, chart rooms, or other forms of publicly accessible interaction. We use your email address, mailing address, and phone number to contact you regarding information about us, administrative notices, new product offerings, and communications relevant to your use of the Site. We do not sell, rent, trade or share any personal information about you to any third party. Also, we will not disclose any personal financial information such as credit card information. However, we cannot ensure that all of your private communications and other personal information will never be disclosed. For example, we may be forced to disclose information to the government, law enforcement, or third parties under certain circumstances. In addition, third parties may unlawfully intercept or access transmissions or private communications. LinkyCat.com cooperates with the government and all law enforcement inquiries and reserves the right to reveal your identity and/or whatever information we know about you. Therefore, although we use industry standard practices to protect your privacy, we do not promise that your personal information or private communications will remain private. When you order our products online, you are asked to provide contact information (e.g. name, address, etc.) and payment information (e.g. credit card number, expiration date). This information is used for billing purposes and to fill your order. If we have trouble processing an order, this contact information will be used to get in touch with you. This Web site contains links to other sites. Please be aware that we are not responsible for the privacy practices of such other sites. 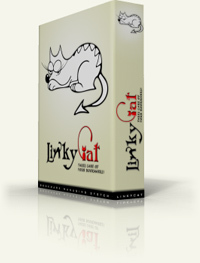 LinkyCat.com uses industry standard efforts such as firewalls and Secure Socket Layers (SSL) to safeguard the confidentiality of your personal information. Last Updated: April 21, 2006. Get Free Trial Version Now!